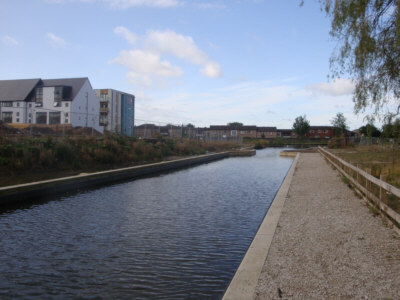 The Ashton Canal between Market Street, Droylsden and Fairfield Junction. These pages will take you for a virtual walk along the route of the Hollinwood Branch Canal. The photographs will give you a good impression of what the canal route is like. These pages also include walking directions to enable you to walk the canal route yourself, if you should wish. The virtual walk along the canal begins in Droylsden Town Centre, on the A662, on main bus routes from Ashton and Manchester. From the traffic lights in the centre of Droylden, walk southwards along Market Street, following the road as it bends to the right. A short distance ahead the road crosses the Ashton Canal. Turn right, along the towpath. 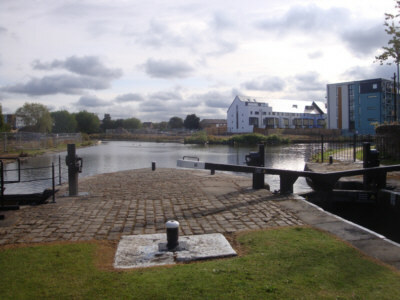 On the right-hand side of the canal are new apartments which are part of the Droylsden Wharf development. Ahead, where the canal turns left into a lock, there is a wide area of canal to the right. This is Fairfield Junction, the junction with the Hollinwood Branch, which ran north-eastwards from here. 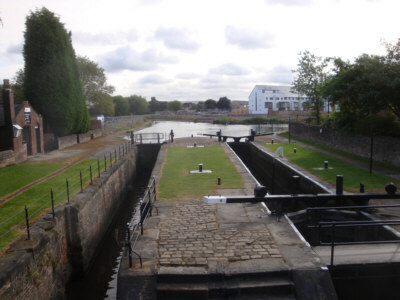 Cross the two lock chambers by the metal footbridges and start to walk back along the opposite side of the canal. It is interesting to note that this lock was formerly a "double lock". It had been duplicated to reduce congestion when the canal was very busy. The original lock, the one furthest from the towpath, is no longer in use. 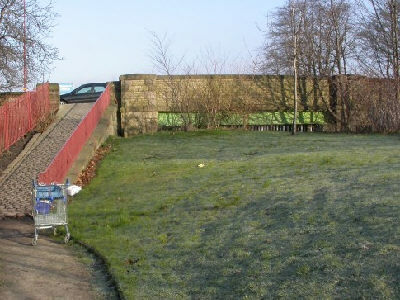 The stone bridge downstream of the lock was built to enable boat horses to cross to reach the towpath of the Hollinwood Branch. Looking along the re-opened section of the Hollinwood Canal from the Ashton Canal towpath. 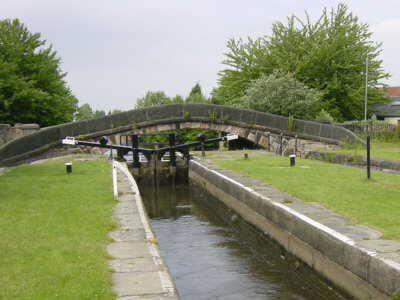 Fairfield Lock on the Ashton Canal, showing the stone-arched towpath bridge. 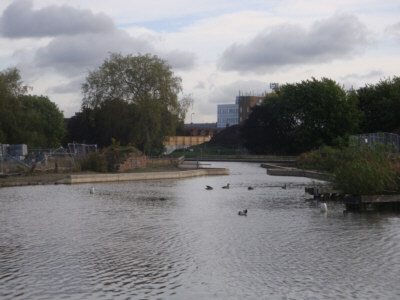 The two chambers of Fairfield Lock. The original lock chamber was that on the left. Fairfield Junction - the Hollinwood Branch curves off to the left while the main line turns to the right. Walk north-westwards along the towpath on the left, heading back towards Droylsden. You will soon come to the start of the re-opened section of the Hollinwood Branch. 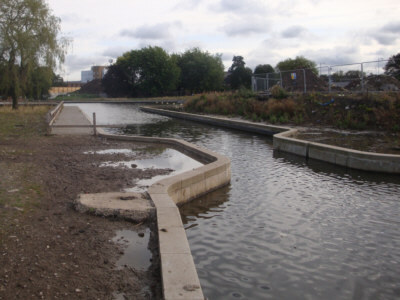 The first 175 metres of the canal has been re-built as a concrete channel, leading to a basin that accommodates Droylsden Marina. Looking along the re-opened section of canal towards Droylsden Marina. Looking back towards Fairfield Junction. Eventually new housing will be built along both banks. 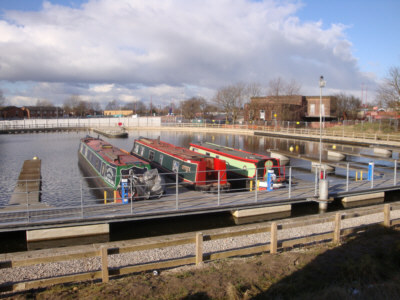 Droylsden Marina in the basin at the head of the re-opened section of canal. 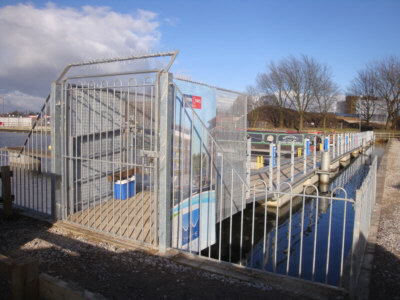 Secure pedestrian entrance to the boat moorings situated at Droylsden Marina. 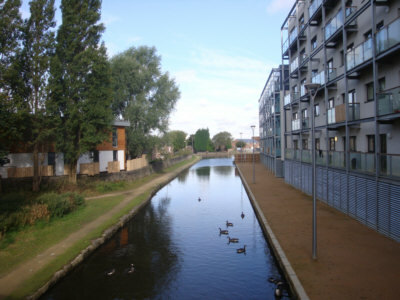 From the northern end of the canal basin, the infilled line of the canal continues towards Manchester Road. The bridge under the road is still intact, although currently blocked up. 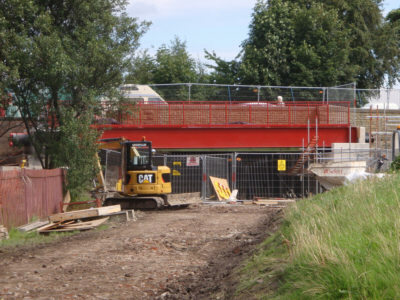 A new footbridge has been erected across the canal line for pedestrians on Manchester Road. This has enabled the roadway to be widened for construction of the Metrolink tramway without obstructing future restoration of the canal. Manchester Road Bridge, Droylsden before work on the Metrolink line began.. 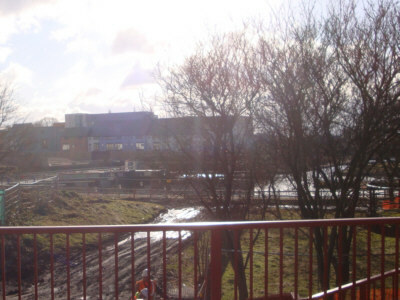 The new footbridge alongside Manchester Road Bridge during construction work. When construction work is completed, you will be able to walk along the line of the canal and up a new ramp to Manchester Road Bridge. While construction work is underway you will need to retrace your footsteps to the western side of the marina and follow the access road to Edmund Street. Turn right, then right again to reach Manchester Road Bridge. Looking south from Manchester Road Bridge, Droylsden, towards Droylsden Marina. 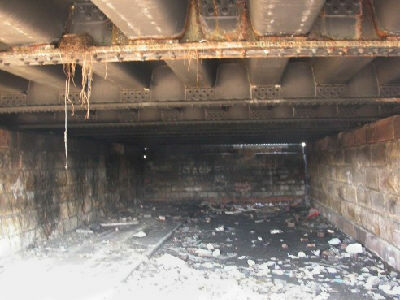 The underside of Manchester Road Bridge, Droylsden. The towpath is visible on the left.